Submitted by Mary Serr on Thu, 04/05/2012 - 15:12. 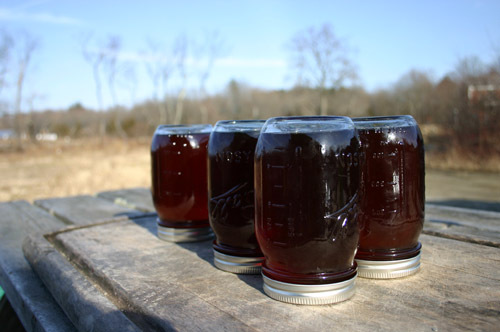 In a typical year, Bay State producers of maple syrup run full steam from February into March – and sometimes into April. But 2012 has been far from normal. The sap started its run in January and by early March was virtually tapped out. “We made about 25 percent of our normal amount of finished syrup,” said Matt Celona, crops manager at Drumlin Farm in Lincoln. Celona oversees a team of volunteers, hired help and farm staff at Drumlin, a demonstration farm and sanctuary run by Mass Audubon. Sugaring operations at Gaining Ground fared better. The Concord-based hunger relief group taps sugar maples at dozens of locations in Concord and Carlisle, including Emerson Field, the Concord and Carlisle libraries, South Burying Place and Towle Field, as well as private residences. “Our sugaring season went surprisingly well given the strange weather, but we definitely did see some effects from the warm winter temperatures,” said Michelle de Lima, co-farm manager. Optimal sap flow occurs when overnight temperatures drop to the 20s and daytime temperatures reach the lower 40s. These conditions set up a kind of pump action in the trees, bringing nutrients up after a winter “sleep” to prepare the trees for budding. Some commercial sugar houses decided not tap at all this year. For example, Turtle Lane Maple Farm of North Andover, the closest commercial sugarhouse to Boston, suspended sugaring for the first time since it began operations in 2004. Although no tapping is underway, owners Paul Boulanger and Kathy Gallagher have kept the farm open for tours. Local sugaring problems were felt across the Bay State. The Mass. Maple Producers Association (MMPA) reported the majority of sugarmakers produced between 50 percent and 75 percent of a normal crop for the season. Farmers in the western part of the state – those at higher elevations – saw a better crop than those in lower-lying areas to the east. Even Vermont, the nation’s top producer of maple products, took a hit from the weather. A Vermont sugarmakers trade group reported the state’s average production was half to two-thirds that of an average year. And sugarmakers in the Midwest (Wisconsin and Minnesota are big producers) have seen a similar trend. It’s too early to tell exactly what economic toll this season’s poor harvest will take on Bay State farmers. The decision not to tap reportedly cost the owners of Turtle Lane Maple Farm around $10,000 (happily, both have day jobs). As for those who did tap, most will make something from the season, and look forward to summer. Sugaring is a way many full-time farmers earn extra cash before it’s time to start spring planting. “Massachusetts boasts more than 300 maple producers, who annually produce about 50,000 to 60,000 gallons of maple syrup worth almost $3 million,” according to Reggie Zimmerman of the Massachusetts Executive Office of Energy and Environmental Affairs. Gaining Ground, however, has syrup that will be distributed to its community partners, including food pantries, shelters and meal programs throughout Greater Boston. Most will be distributed this spring, said Michelle de Lima, but some is always reserved for Thanksgiving baskets. Kayleigh Boyle, de Lima’s co-farm manager at Gaining Ground, shared two favorite recipes for those who want to celebrate the end of the sugaring season. Place dough In a greased bowl until double in size, punch down and put into two greased loaf pans (dough may be sticky). No kneading necessary! Let rise until doubled in size, then bake at 350 degrees for 45 minutes. *The key to this recipe is getting the temperature just right. Too low and the corn will not pop. Too high and the maple syrup will quickly burn. A standard medium heat does well. Begin by placing a large heavy pot (fitted with a lid) over medium heat. Add the coconut oil, maple syrup and a dash of sea salt. Allow to heat until gently bubbling. Add the popcorn and cover with a lid. Keep a close eye on the liquid. If it begins to brown, lower heat slightly. Once corn begins to pop, keep the pot moving over heat to keep from burning. Once popping tapers off, remove lid quickly (keeping any condensation from dripping onto popcorn). Immediately transfer to a large metal bowl. Sprinkle with additional sea salt and enjoy.